Exclusive GRAMMY U® Off The Record With 10-Time GRAMMY® Winner Chaka Khan in conversation with Rita Ora live from the Recording Academy. The year 2013-2014 marks Chaka’s 40th anniversary in music and entertainment.The year-long celebration will conclude with the release of her first songbook for piano, vocal and guitar, The Chaka Khan Songbook. Chaka Khan is a true Renaissance Woman. A singer, songwriter, producer, visual artist, author, actor, philanthropist, entrepreneur, activist and mother. Chaka is an international music icon who has influenced multiple generations of artists and continues to do so. 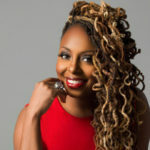 From the moment she burst onto the music scene in the 1970s as the 18-year-old lead singer of the multiracial band Rufus, her powerful voice and show-stopping stage presence set her apart from any other singer, and during her 40-year career, she has developed a vast international fan base and performed on six continents. Chaka is a ten-time GRAMMY® Award winner (with 22 GRAMMY® nominations) who has the rare ability to sing in eight genres, including R&B, jazz, pop, rock, gospel, country, classical and dance music. She has released 22 albums and racked up ten #1 Billboard magazine charted songs, eight RIAA certified gold singles and eleven RIAA certified gold and platinum albums. Chaka’s recorded music has produced over 2,000 catalogue song placements. This exclusive live G+ Hangout On Air will give GRAMMY U members the chance to hear about Chaka’s beginnings in Chicago through numerous awards for her extraordinary achievement in music and entertainment. We welcome you to join the conversation about her new Songbook and hear the method behind Chaka’s undeniable legendary acclaim.